The breaking news is that SBI has uploaded the interview call letter for the prospective candidates of probation officer posts on official website. According to the notice published on the official website, the interview letters can be downloaded from 17th August 2017 onward on the official website. The interview will be commenced from 16th September 2017. The online interview call letters will also be closed on the same date. First, you need to login your account and then fill the choice of circle preferences. The choice will be taken into consideration while posting the finally selected candidates. Select the circle preference and then click on the submit button. Latest News (07.07.2017) - The process for uploading interview call letter has been initiated. The intimation for interview schedule/dates may be sent on the email ID of the selected candidates. 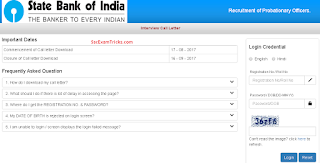 State Bank of India (SBI) has released mains examination admit card on 18th May 2017 at www.sbi.co.in. The mains exam admit card link will be lapsed on 04th June 2017. 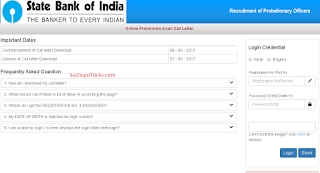 The latest update has been observed from the state bank of India when SBI has uploaded its preliminary examination admit card at www.sbi.co.in. These admit card will be available up to 07th May 2017. The Pre-Exam online admit card has been released and can be downloaded from the direct link given here. Also note down the date of Examination which will be held in April-May 2017. You can see the image (give below) for your assurance of release of online call letter for SBI Pre-Exam 2017. It is definite that State Bank of India (SBI) has made all preparation for uploading SBI PO Admit card 2017 for Pre exam on 15th April 2017 at www.sbi.co.in. The Preliminary examination has been scheduled to be held on four different dates such as 29th, 30th April and 6th, 7th May 2017. Enormous candidates are going to attend the examination. So they need to download SBI PO Pre Admit Card from official website for appearing in the exam. 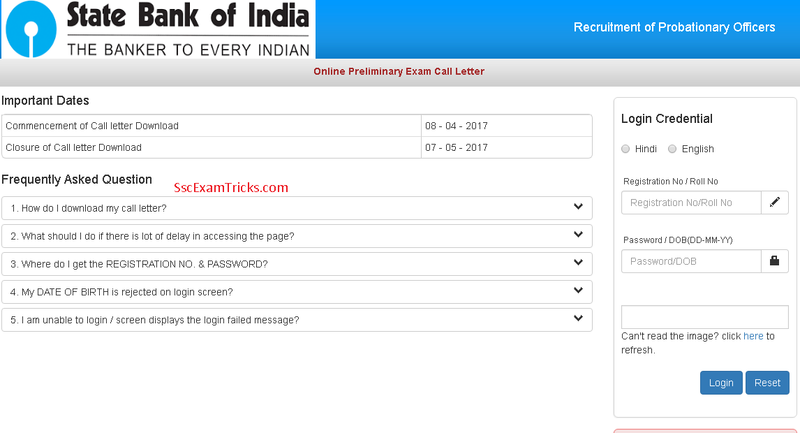 Those candidates who have been applied and now waiting for their online hall ticket; they can download their SBI PO Pre Exam Admit Card 2017 from direct link given here. The quick and easy steps for downloading of these hall ticket are discussed in the last section of this post. Earlier SBI had notified and invited online registrations from 07th February to 06th March 2017 on official website. Thousands of interested and eligible applicants had applied for these posts. The Pre, Mains and Interview along with group discussion are the criteria for final selection of the candidates. The exam date of preliminary and mains and interview has been scheduled. The cut off marks will be evaluated at each selection stage. 1. Click on the direct link given at the lowermost position of the page. 2. The link will reach you to the official page where you will have to enter your login details such as registration number and date of birth. 3. Enter the captcha given in the image. The admit card will be downloaded in your system which can be printed on A4 size clean piece of paper.